Late-night host Jimmy Kimmel announced to his audience Wednesday night that he had purchased a box full of merchandise from the online Trump organization family store and is now threatening to file an official complaint against the Trump Family. 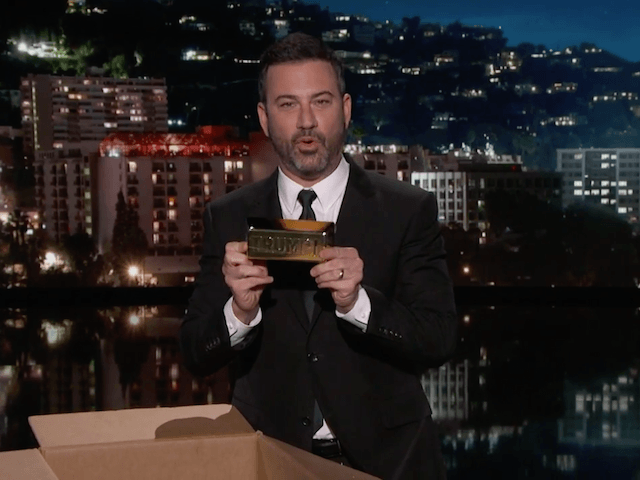 Opening a box from the Trump store live on his ABC show, Kimmel sneered that most of the Trump organization merchandise was made in China or other countries overseas. He also showed off a Trump-branded gold bar coin bank and a pet bandanna that did not list the country of origin on the merchandise. Seeing this as a potential federal offense, Kimmel then cited United States Customs and Border Protection laws about imported goods requiring that the country of origin be stamped on the article, noting that companies could be fined $500,000 per item for failing to comply. Kimmel said he would file an official complaint, warning them that it would be “very expensive” if they got busted. “I’m sure Eric and Don Jr. didn’t know about this. I’m sure this was a simple oversight. I’ll just file an official complaint and let them sort it out,” Kimmel quipped as the audience cheered and applauded. Jimmy Kimmel called Trump’s sons “Uday and Qusay” after former Iraq dictator Saddam Hussein’s sons, noting that they were “making a lot of money selling crap” with Trump’s name on it. The Trump organization store is separate from the Trump campaign store, where all of the products are made in America.